Fall is finally here! Thanksgiving is just a few weeks away and I'm getting all the fall layering in before it gets really cold. I'm still totally crushing on blanket scarves, but I love finding new and interesting ways to wear them. This belted look was surprisingly warm and still super chic. Oh, and can we talk about all of these leaves?! I feel like everything took longer to turn color this year, but I'm really enjoying the view out my window so close to the holidays. The kids have been loving running through the piles and tossing them around. We have two of these trees and they're both still completely full of bright, yellow foliage so I think our front yard is sufficiently prepared for fall now! My usual fall layer look is a cardi and jeans (basic, I know), so I'm trying to find some different ways to make the most of my fall wardrobe this season! How do you rock layers in the fall? That's such a cute way to wear a blanket scarf! It's still too hot here for scarves, but hopefully soon! Cute photos. 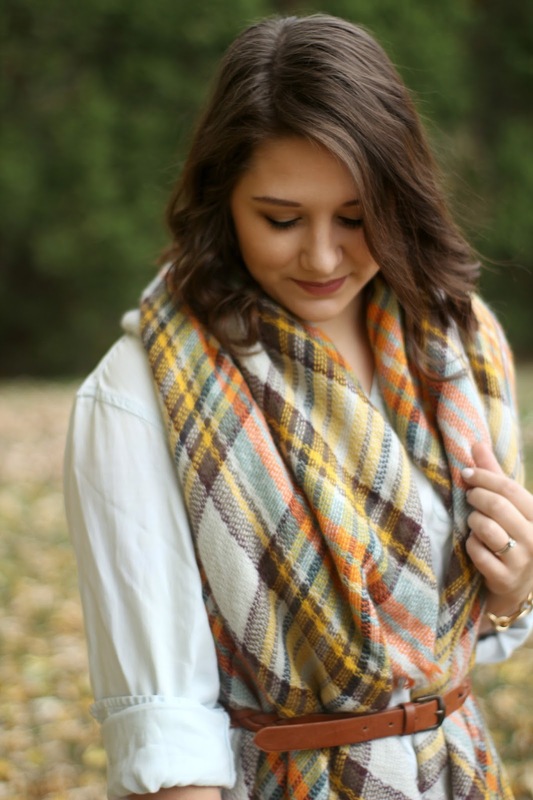 Love how you belted this scarf! I love belting a long scarf! I love, love, love your entire outfit (especially since your boots are flats!) I have a thing for plaid right now! These pictures are adorable! 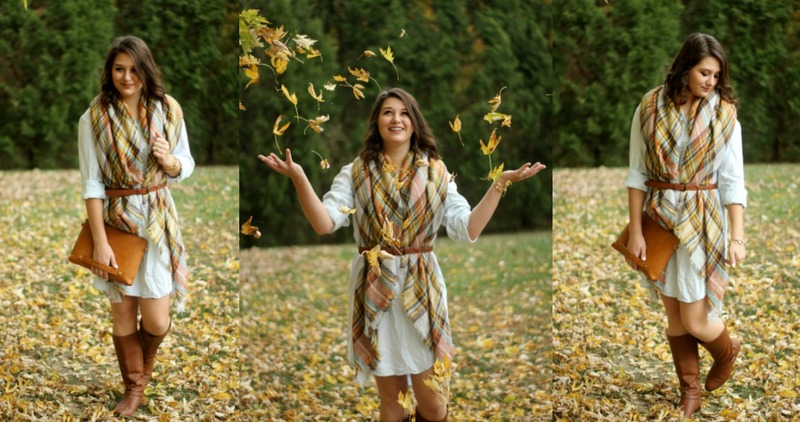 I love the fall leaves and your scarf matches them perfectly! I love how you belted that scarf with your dress! So chic! I love this look! The colors in the scarf are just perfect on you! You've inspired me to try this again. I tried doing this once this week and I felt like it just looked odd....but now I'm going to try it again because this is so cute. Maybe I need to just find the right belt. I love your cutch! this layering shirt dress and combination with the scarf so chic and a great basic to have for fall! I also adore that outfits! So perfect for fall& autumn! I love the belted scarf and tan accessories! Beautiful photos in all the leaves!